Access your account information or make payments online via our Customer Account Center with your current login information. Even though our name is changed, you can still count on the same exceptional service with Mariner Finance that you have come to expect from Pioneer. In fact, the same team will be there for all of your account and service needs. The same team at your local branch will be there for all of your account and service needs. Going forward the communications will come from Mariner Finance. Thank you again for giving Pioneer and Mariner Finance the opportunity to serve you. If you have any questions regarding these changes or if we can be of further assistance, please contact us at 877-310-2373. 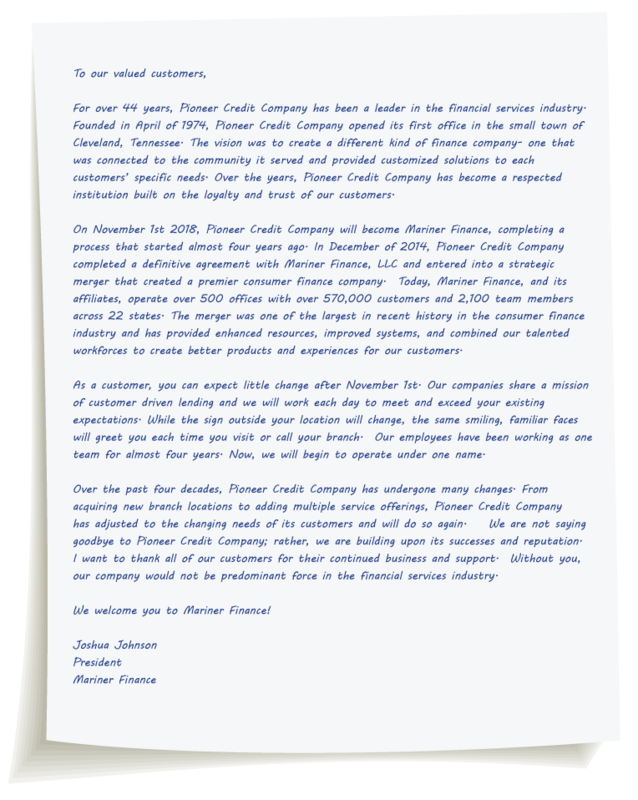 You are about to leave pioneercredit.com.